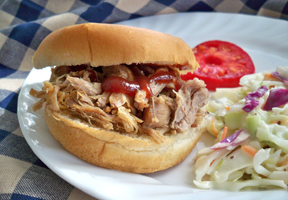 Place pork shoulder in a slow cooker. 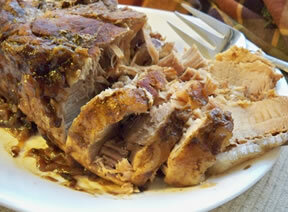 In a small bowl, combine the remaining ingredients and pour over the pork roast. Cover the slow cooker with the lid and cook on low for 10-12 hours. Remove the roast to a tray or cutting board. Using two forks, pull the meat apart until shredded. 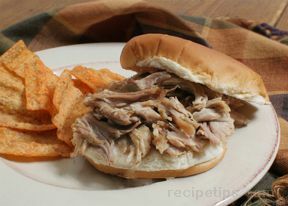 Place shredded pork in a large bowl and pour some of the liquid from the slow cooker over the meat until it is as moist as you like. Return the meat to the slow cooker to keep it warm until ready to serve. Serve on fresh buns for sandwiches. 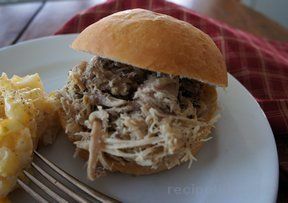 "I made this for our house warming party, and my husband made some BBQ sauces to go with the sauce that is poured over the pork once it's done and WOW, it really took some of the tangy taste away, love the recipe, would definitely make it again!!!"